Merge Games has announced that they have teamed up with Team Crimson to bring Crimson Keep to the Nintendo Switch. The First-Person rogue-like action RPG is set to launch next week on November 29th, 2018. It will priced at £14.99 / €19.99. An introductory 20% discount is also available between November 22nd and December 6th. If you would like to know more about this procedually generated dungeon crawler, you can find the official Press Release below along with a trailer. Descend into the depths of Crimson Keep, a rogue-like, first-person, action RPG. Thursday November 22nd, 2018, Manchester, UK – Merge Games together with developers, Team Crimson, is proud to announce the imminent release of Crimson Keep, a rogue-like, first-person, action RPG. The game is set to launch on Nintendo Switch on Thursday November 29, 2018. Thirty years ago, a curse destroyed the entire village of Larkstead. Banished to the dungeons below, your only hope is to explore, scavenge, and fight for survival. Will you find the mysterious Crimson Keep? Will you escape this terrible place? Or will you be food for the innumerable beasts and horrors that lurk in the depths below? Crimson Keep’s a game about exploration, combat and survival. The team have combined RPG progression, rogue-like gameplay and first-person action to make something very rewarding and fun. Descend into an ever-changing labyrinth full of monsters, traps, and treasure. Locate the sunken remains of an ancient castle and cleanse it. The great power you find within could be your only hope of escape. Every drop of XP, every piece of loot, and every bit of damage you take could determine whether you survive, or succumb to The Keep’s dark power. You will die… often. 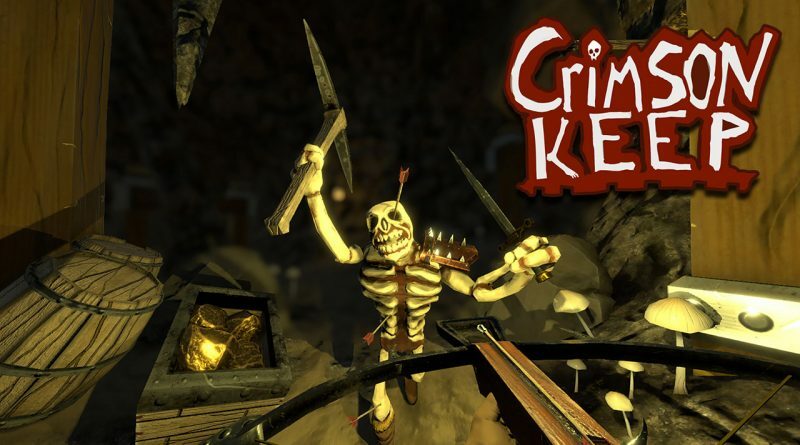 Crimson keep features procedurally generated dungeon layouts meaning enemies never appear in the same spot and objects such as traps and shrines move every time the player dies. Crimson Keep challenges players with perma-death, cursed items, hunger and deities. If you die you lose everything. On the plus side, if you manage to complete a zone, you’ll begin from its start point when you respawn. Crimson Keep is available to pre-order from the Nintendo eShop from November 22nd and is set for a Nintendo Switch release on Thursday November 29th, 2019. Crimson Keep will carry a price tag of £14.99 / €19.99. All purchases made between November 22 and December 6th will receive a 20% discount as part of an introductory offer.